Being a poor college student, I’m very easily persuaded to cut things out of my budget wherever possible in order to save a few bucks. This includes cable, because, well, I can watch most of the things I want (legally) online. With streamng, and the advent of DVD seasons it’s now possible, with a little effort, to supplant your TV with your computer. Boxee makes that easier. As a platform for streaming TV, along with organizing my own files, it significantly cuts down the time I spend wading around video. 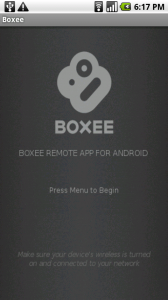 I’m not going to go into the whole pitch about why Boxee is good, because this isn’t about reviewing Boxee: this post is about an app that makes using Boxee a little bit more simple. Boxee Wifi Remote is a step closer to Boxee’s complete replacement of my TV. As long as I’m on the same wifi Internet connection as my computer, I can use my phone to manipulate Boxee. It gives me all the standard controls: an on-screen d-pad, forward and back buttons, and even a timeline for skipping around video. 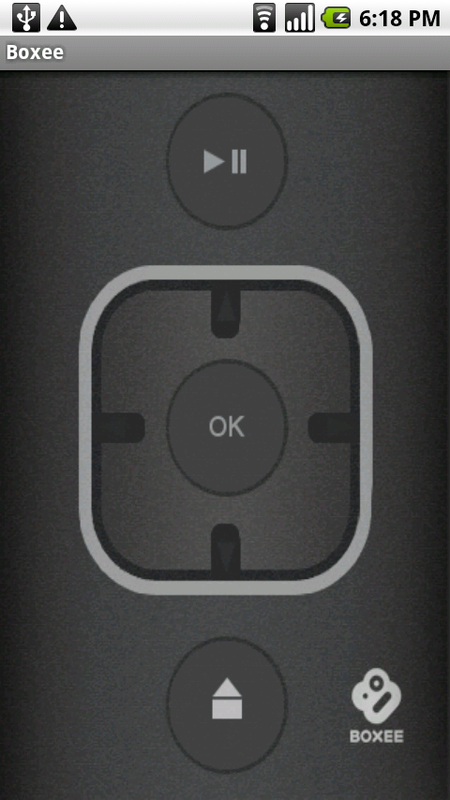 The remote even takes advantage of the Droid’s keyboard, which lets you type in text fields. This is a big deal to me, as universal remotes only go so far. I have to commend the developers for thinking this far ahead. However, what makes this app great is the ease of setup; enabling one setting inside the Boxee client (shown above) allows it to be recognizable on the network. Once my phone’s connected, as well, the app scans for linked computers, bringing up a list which includes the name of my PC. From there, the app does its thing and connects. The remote interface comes up, and away we go. The only complaint I have about this app is a small one. The graphics of the remote itself seem a bit lackluster; the buttons aren’t very sharp, and don’t provide any tactile sensation. Thought it lacks haptic feedback, I believe that if the button looks more physically attractive, it makes up for the lack of vibration. This could just be a resolution thing with my Droid, but ultimately, it’s not a big deal. 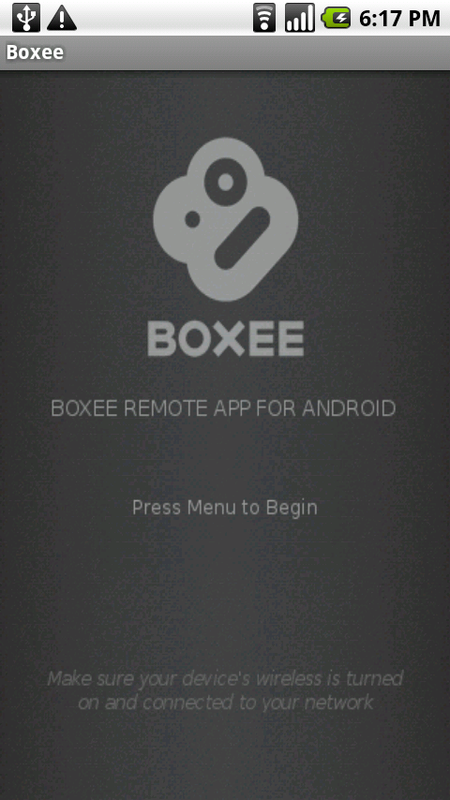 Ultimately, Boxee Wifi Remote does something that some apps fail to do: just work. 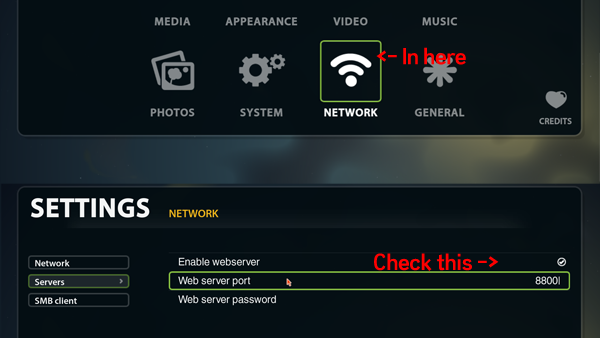 Even though this is a third-party app, I didn’t have to do any fancy customization to my client, router, network or computer in order to have it function, and that scores major points with me. Another cool thing to notice is that because the remote depends on wifi (not IR), the remote will work anywhere in your house, as long as it has signal. Pausing from the bathroom, anyone?